Montreal Canadiens goaltender Carey Price encouraged First Nations youth during his acceptance speech for one of the four trophies he won during last night's NHL Awards in Las Vegas. 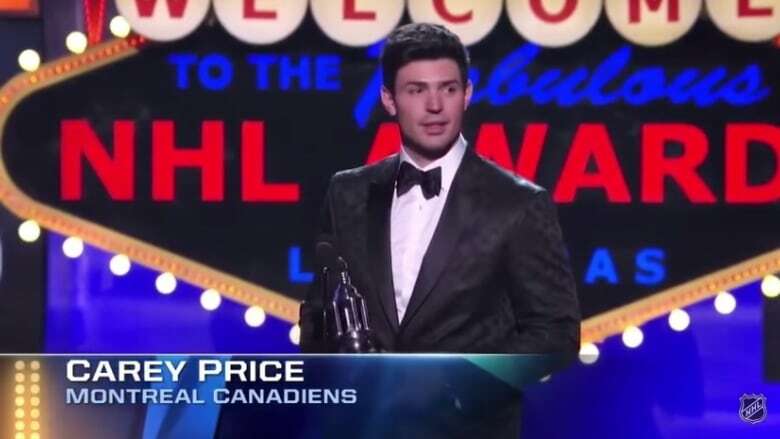 Montreal Canadiens goaltender Carey Price encouraged First Nations youth to be leaders in their communities as he accepted one of four trophies he won at last night's NHL Awards in Las Vegas. "I would like to take a moment to encourage First Nations youth," said Price, who was raised in the largely aboriginal community of Anahim Lake, B.C. "People would say it's very improbable that I'd make it to this point in my life," he said in a minute-long speech to some of the most decorated hockey players in the world, while accepting the Vezina trophy for best goalie. "I made it here because I wasn't discouraged. I worked hard to get here, took advantage of every opportunity that I had. And I would really like to encourage First Nations youth to be leaders in their communities. Be proud of your heritage, and don't be discouraged from the improbable." Price finished his speech by saying "chanalya" — "thank you" in the Dakelh language, spoken by the Ulkatcho people, who are part of the Carrier First Nation. A group of Cree youth responded with a thank you of their own, which was posted to Twitter on Thursday. Hart Trophy (NHL most valuable player, chosen by pro hockey writers). Ted Lindsay Award (most outstanding player, as voted by players). Jennings Trophy (fewest goals allowed), share with Corey Crawford of the 2015 Stanley Cup-winning Chicago Blackhawks. Price's hefty haul of hardware capped one of the greatest regular seasons for a goalie in NHL history. They go along with the gold medal he earned as netminder for Team Canada at the 2014 Sochi Olympics. "I'm just grateful," Price said. "I'm immeasurably blessed to do what I do."